Efficiency and a safe future are as important for plant construction as cost savings and error reduction during the planning phase. The fourth industry revolution starts today with Industry 4.0. To meet these demands an investment in new technology is necessary. A technology that has the potential to give a positive impulse to plant construction in general and to the glass industry in particular. Precision and efficiency are indispensable from the start of a project, well before a glass plant is put into operation. 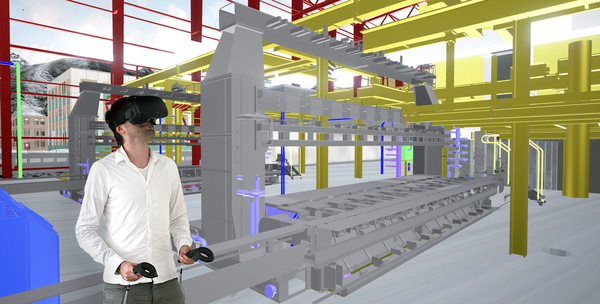 In order to meet these requirements, cm.project.ing GmbH invests in the application of Virtual Reality (VR) and uses the possibilities of this technology regarding an efficient and future guaranteed layout planning for the glass industry. When constructing a new glass plant, the investment is very high and each plant is unique and has to fit to the local and technical requirements of the site. The layout of a glass plant determines plant components, access, machines and equipment for years to come. A thorough layout is particularly important. VR is by no means a replacement for 2D and 3D planning, instead it has to be seen as an expansion of, and in addition to, existing planning steps towards an intelligent layout. The more complicated a factory is and the more parties involved in the process, the more errors are likely to occur. Where multiple interfaces exist, errors are unavoidable. VR helps to locate and minimize errors at an early stage. It can detect weak spots in 3D models during layout planning. Inconveniently positioned equipment, pipes, instruments or valves that are hard to reach. In a virtual model, future works processes such as production or maintenance can be simulated. The staff can adapt and be trained virtually for their new work place. During the planning, process adjustments and changes can be made in the model to create a well thought-out layout concept which is submitted to virtual testing in all aspects. Only if the planned factory has passed the practical test is it ready for the real execution. CFD stands for "computational fluid dynamics" and is a mathematical calculation and visualization of fluid dynamics. With the help of this technology it is possible to analyze currents of any kind and to recognize their behavior and influence. CFD simulation can be used to analyze and optimize a glass factory in its entirety or in specific subareas. cm.project.ing GmbH has enhanced its planning methods through the use of CFD in order to further emphasize the holistic approach to the glass process. Many times, the planning of the production building is paid too little attention; instead it is seen merely as a shell only necessary for plant components. CFD visualization helps with the optimal dimensioning of air supply openings as well as the positioning of machines within the building. Outdoor climate conditions and their impact on the production process are also simulated, so that a consistently high level of plant efficiency can be guaranteed. In contrast to experience and extensive subsequent changes to the construction, the advantage of CFD lies in the fact that different design scenarios can be simulated in advance, during planning, in order to achieve the optimal outcome. Thus potential thermal and fluidic problems in the later work are avoided. Also existing factories can experience advantages by utilizing CFD analysis and adjustments. cm.project.ing GmbH therefore sees the detailed integration of the production building as well as an optimized layout design as an integral part of the overall production process ensuring the way to a highly efficient glass factory. Innovative approaches in building design, ventilation systems and heat generation combined with the use of CFD simulations therefore create a great benefit for operators of glass factories in terms of increased efficiency and cost reduction.